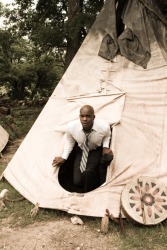 A modern businessman is a teepee is an anachronism. The definition of anachronism is a person or thing that is placed in a time period where it does not fit. If a movie about ancient Egypt showed a Pharaoh wearing a wristwatch, the wristwatch would be an example of an anachronism. "anachronism." YourDictionary, n.d. Web. 18 April 2019. <https://www.yourdictionary.com/Anachronism>. A chronological mistake; the erroneous dating of an event, circumstance, or object. A person or thing which seems to belong to a different time or period of time. From Latin anachronismus, from Ancient Greek ἀναχρονισμός (anakhronismos), from ἀναχρονίζομαι (anakhronizomai, “referring to the wrong time”), from ἀνά (ana, “up against”) + χρονίζω (khronizo, “spending time”), which from χρόνος (khronos, “time”). The story which tells how the two went out one morning to dance round a tree of liberty in a meadow is an anachronism, though in keeping with their opinions. But if the Order had now become a superfluous anachronism, it had still to be disposed of, and this was no easy task. It needed but a jolt to bring down the crazy anachronism, and the jolt came when, in 1558-60, floods of Muscovites poured over the land, threatening the whole province with destruction.